Erysipelothrix rhusiopathiae is a nonmotile, nonspore-forming, facultative anaerobic, gram positive rod commonly found in nature. It rarely causes disease in humans and usually occurs as localized skin infections associated with occupational disease. Although E. rhusiopathiae is mentioned as a rare infection agent in orthopedic literature, the reports of the last decade show that is considered to be one of the bacterial agent for reactive arthritis, osteomyelitis, prosthetic infection and spondylitis. In this case report, we present a case of osteomyelitis which is caused by E. rhusiopathiae in a patient with diabetes mellitus and hypertension. A 65-year-old woman with type 2 diabetes and hypertension was referred to the wound care unit with a wound that occured with an unknown reason three months before. Radiologically, direct gross appearance of the patient showed osteomyelitis-compatible appearance in the bone tissues beneath the wound-compatible region. E. rhusiopathiae was identified as a result of mass spectrophotometry after 48 hours in the bone tissue culture taken from the patient after debridement. Patient recovered with the completion of the treatment ampicillin-sulbactam 1X500 mg / day intramuscularly. Erysipelothrix rhusiopathiae doğada yaygın olarak bulunan hareketsiz, sporsuz, fakültatif anaerob, gram pozitif basildir. İnsanlarda nadiren hastalık yapar ve genellikle meslek hastalığı ile ilişkili olarak lokalize deri enfeksiyonları şeklinde görülür. Ortopedik literatürde nadiren enfeksiyon etkeni olduğundan bahsedilse de son on yıldaki raporlar, E. rhusiopathiae'nin reaktif artrit, osteomiyelit, prostetik enfeksiyon ve spondilit için bakteriyel etkenlerden biri olarak kabul edildiğini göstermektedir. Bu olgu sunumunda diabet ve hipertansiyonu bulunan hastada E. rhusiopathiae’nın etken olduğu osteomiyelit vakası sunulmaktadır. 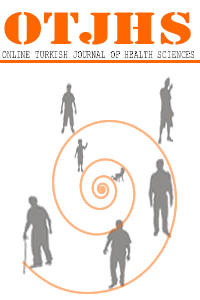 Tip 2 diabetes mellitus ve hipertansiyonu olan 65 yaşında kadın hasta üç ay öncesinde sağ ayak topuğu medial bölgesinde hatırlayamadığı şekilde ortaya çıkan ve iyileşmeyen yara nedeni ile yara bakım birimine yönlendirildi. Radyolojik olarak hastanın direkt grafisinde yaranın bulunduğu bölge altındaki kemik dokularda osteomiyelit ile uyumlu görünüm izlendi. Debridman sonrası hastadan alınan kemik doku kültüründe 48 saat sonra üreyen bakterinin kütle spektrofotometresi (VITEK MS, bioMerieux, Fransa) ile identifikasyonu sonucunda E. rhusiopathiae olduğu saptandı. Bir ay süre ile intramüsküler yoldan 3X1500 mg/gün ampisilin-sulbaktam tedavisi sonrası hastada iyileşme görüldü. Kaynaklar1. Koch, R. Investigations into theetiology of traumatic infective diseases. New Sydenham Society, London 1880. 3. Venditti M, Gelfusa V, Castelli F, Brandimarte C, Serra P. Erysipelothrix rhusiopathiae endocarditis Eur J Clin Microbiol Infect Dis 1990; 1: 50-2. 4. Grieco MH, Sheldon C. Erysipelothrix rhusiopathiae. Ann NY Acad Sci1970; 174: 523-532. 5. Robson JM, McDougall R, van der Valk S, Waite SD, Sullivan JJ. Erysipelothrix rhusiopathiae: An uncommon but ever present zoonosis Pathology 1998; 30: 391-4.6. Andrychowski J, Jasielski P, Netczuk T, Czernicki Z. Empyema in spinal canal in thoracicregion, abscesses in paravertebral space, spondylitis: in clinical course of zoonosis Erysipelothrix rhusiopathiae. EurSpine J 2012; 21: S557-563. 7. Elvy J, Hanspal I, Simcock P. A case of Erysipelothrix rhusiopathiae causing bilateral endogenous endophthalmitis. J Clin Pathol 2008; 61: 1223-1224. 8. Feasi M, Bacigalupo L, Cappato S, Pontali E, Usiglio D, Rollandi GA, Filauro M, Mori M, Cassola G. Erysipelothrix rhusiopathiae intra-abdominal abscess. Int J Infect Dis 2010; 14: e81-83. 9. Hardman SC, Carr SJ, Swann RA. Peritoneal dialysis-related peritonit is with bacteraemia due to Erysipelothrix rhusiopathiae. Nephrol Dial Transplant 2004; 19: 1340-1341. 10. Hocqueloux L, Poisson DM, Sunder S, Guilbert S, Prazuck T. Septic arthritis caused by Erysipelothrix rhusiopathiae in a prosthetic kneejoint. J Clin Microbiol 2010;48: 333-335. 11. Jones N, Khoosal M. Erysipelothrix rhusiopathiae septicemia in a neonate. ClinInfectDis 1997; 24: 511. 12. Kim SR, Kwon MJ, Lee JH, Lee NY. Chronic meningitis caused by Erysipelothrix rhusiopathiae. J Med Microbiol 2007; 56: 1405-1406. 13. Norman B, Kihlstrom E. Erysipelothrix rhusiopathiae septicemia. Scand J Infect Dis 1985; 17: 123-4. 14. Tan EM1, Marcelin JR1, Adeel N2, Lewis RJ2, Enzler MJ1, Tosh PK1. Erysipelothrix rhusiopathiae bloodstream infection - A 22-year experience at Mayo Clinic, Minnesota. 2017 Nov; 64(7): e65-e72. 15. K. Tolis1, S. Spyridonos1, S. Tsiplakou2 and E. Fandridis1 Tenosynovitis of a digit due to Erysipelothrix rhusiopathiae: case report and review of the literature New Microbes New Infect. 2015 Nov; 8: 128–130. 16. Mukhopadhyay C., Shah H., Vandana K.E., Munim F., Vijayan S. A child with Erysipelothrix arthritis beware of the little known. AsianPac J Trop Biomed. 2012; 2: 503–504. 17. Marc Romney, MD,1 Stephen Cheung, MD FRCPC,2 and Valentina Montessori, MD FRCPC2 Erysipelothrix rhusiopathiae endocarditis and presumed osteomyelitis Can J Infect Dis. 2001 Jul-Aug; 12(4): 254–256. 18. Gorby, G. L.,and J. E. Peacock, Jr. 1988. Erysipelothrix rhusiopathiae endocarditis: microbiologic, epidemiologic, and clinical features of an occupational disease. Rev. Infect. Dis. 10: 317-325. 19. Heilman, F. R. and W. E. Herrell. 1944. Penicillin in thetreatment of experimental infections due to Erysipelothrix rhusiopathiae. Proc. Staff Meet. Mayo. Clin. 19: 340-345. 20. Poretz, DM. 1985. Erysipelothrix rhusiopathiae, p. 1185-1186. In G. L. Mandell, R. G. Douglas, Jr.,and J. E. Bennett (ed. ), Principles and practice of infectious diseases, 2nd ed. J. Wiley&Sons, Inc., New York. 21. Annette C, Rebolı and Edmund Farrar 1989 Erysipelothrix rhusiopathiae: An Occupational Pathogen. Clin Microbiol Rev 1989 Oct; 2(4): 354–359.